Indian Prime Minister Narendra Modi tried to convince US President Barack Obama to impose restrictions on Pakistan’s nuclear programme, media reports said on Thursday. 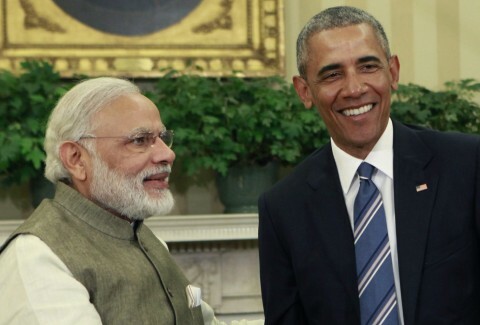 According to reports, Modi and US President met seven times within a span of two years convincing Obama to impose restrictions on Pakistan’s nuclear arsenal. While answering a question, India is getting help from Israel and United States to better its nukes and defence capability, it fears Pakistan’s capability. According to a report, Pakistan has established four reactors in a decade which are producing plutonium used in 25 to 30 kg weapons which are around four per cent more than India’s production. Experts have said that coercive methods are not the answer to stop Pakistan’s nuclear programme thus Modi is using the only option he has which is to increase pressure on Pakistan through the United States. Besides big warheads, small nuclear weapons add immensely to the margin with which Pakistan beats India’s total, the report states. And in return America is asking India to help contain China. Extending occupation of Afghanistan on the one side and convincing regional countries to serve their interests. Some countries in the far east are aleady in their (US) pocket like Sourth Korea, Philipine etc. Now the US is occupying the seas around the Chinese waters in the South and used an International court to decided in their favor. Could there be a bigger example of International Terrorism ? yes bad thing is doing by America, this is showing their fear from China. This is against of degnity.